Heather Swenson is an artist working and living in Rochester, New York. She is currently focusing on silkscreen and collage while exploring new uses of these mediums through building three dimensional structures. Heather has shown work in multiple exhibitions around New York and has had several solo and group shows in Rochester. She teaches a yearly silkscreen workshops through the Print Club of Rochester and is the Vice President of the organization. 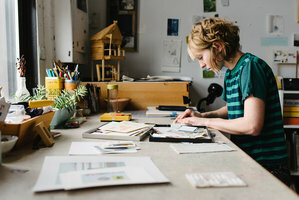 Heather received her BFA in Interdisciplinary Visual Arts with a concentration in painting and printmaking from Purchase College of Art and Design in 2012. Within a multidisciplinary practice of making screenprints, sculptures, and installations I create work that is both derived from experience and invention. I am extremely captivated by the simple act of looking and gather observations from my daily life. By combining these observations with imagined structures and images I aim to make work that references real spaces while still feeling unfamiliar.